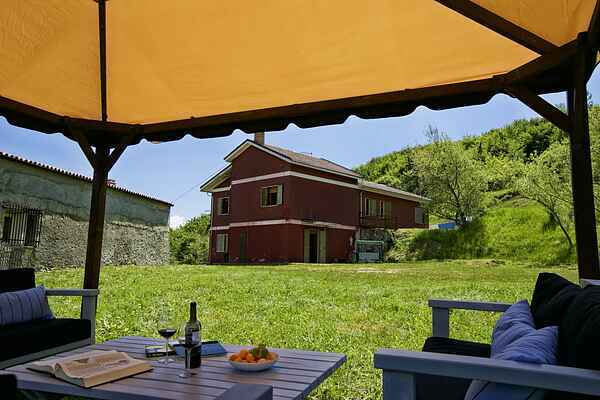 This mountain property is composed of two houses at 1016 m elevation. The location and altitude make the view breathtaking, with a view to two of the highest mountains of the Apennines (Corno Grande of the Grand Sasso massif towards North and Maiella towards South) and, on a clear day, the eye stretches far to the sea. The house was recently renovated with simple and essential lines, a covered panoramic terrace with a table for 14 people complete the decor. The property itself is within the Gran Sasso e Monti della Laga National Park, therefore for nature lovers it's a great location for mountain hikes. Walking trails to the peak of the mountain start from the property itself. There are also multiple attractions within driving distance, like the mountaintop fortress of Rocca Calascio (25 km), the medieval and Renaissance hill town of Castel del Monte (25 km), sulfur springs of Parco Lavino (30 km), the scuba divable cold water lake of Capodacqua (15 km), Caramanico spas (40 km) and the caves of Grotte di Stiffe (50 km).